Animated .GIF Courtesy of Me. Nixies were once the most popular digital display technology in use. The coming of LEDs put a big crimp in their business, but at that time (70’s) LEDs weren’t bright enough to replace them. The LCD and VFD displays, however, proved quite readable in bright environments, and killed the nixie business. A nixie works in a similar manner as an LED. They are both current devices. That is they want to operate within a certain current range (current as in electrical current, measured in amperes, of milliamperes in this case; a milliampere is 1/1000 of an amp). Voltage is relatively unimportant, just as long as its high enough to initiate conduction. For a nixie, that’s called the strike voltage and is normally guaranteed to be at 170V maximum. So supplies of 180V or somewhat higher (up to 200V) are commonly used. Once the nixie strikes the voltage, from anode to cathode, drops to its sustain value. This is usually in the 130V to 150V range. An anode resistor is placed in between the supply and anode, to limit the current. Nixie tubes usually see currents from 1mA to 3.5mA, for small nixies (0.6″ digit height max), and 4mA to 8mA for larger devices. The anode resistor takes up that difference, between the supply and anode, and the current can therefore be calculated by using Ohm’s Law. See formula in drawing, above, for Ia. It’s basically that voltage difference divided by the resistor, Ra. If this resistor were missing, the nixie would still like to drag the 180V supply down its sustain level. With typical nixie supplies, that would finally happen when the supplies maximum is reached. Normally, 25 to 60mA. This will not kill the nixie, immediately, but will age the tube quickly, and it will die within a few hours. If you are using a bench supply capable of delivering “amps”, at this high voltage, then that nixie will disappear in a flash (literally). LED’s work, the same way. Only they have a Forward Barrier Junction Voltage to overcome. Unlike the nixie’s Strike/Sustain level, once conduction starts (in an LED) the voltage levels off. It does not drop to a lower value. But the need for a series resistor (to limit current) still applies. This is scope photo, of a nixie being multiplexed. The two traces are of the anode voltage, and the cathode current. When voltage is applied, it takes some time for the nixie gas in the tube to form an ionized plasma, and conduct current. For nixies this is between 10 to 50uS (0.00001 to 0.00005 seconds) typically. Before conduction the anode sees the full supply voltage (190V in this example). Conduction, once it starts, occurs gradually (~10uS in this case). The anode voltage drops during this time (in phase), due to a required anode resistor inserted between the supply and the nixie’s anode. This is not to be confused with overshoot (of an underdamped system). A nixie is not a reactive component. There is no initial surge. As you can see, the current actually rises rather slowly (relatively speaking). If you multiplex a nixie, you need to add blanking intervals, to avoid ghosting. Ghosting is one tubes data interfering, visually, with its neighbor. Typical blanking intervals, for nixies, are between 100 to 300uS. Blanking is done, by turning ALL anodes OFF. In normal multiplexing operation, the intended digit is turned ON, by lowering its cathode to zero volts, during the blanking interval. Only one cathode ON, at any time. At the end of the blanking interval, the intended anode is turned ON. It should be ON for a display interval between 1mS to 4mS (0.001 to 0.004 sec) . A typical multiplexed frame is: B-H10-B-H1-B-M10-B-M1-B-H10… This is an example of a 4 digit clock display, with B=blanking interval, and H10=10-hours digit, and so on (M10=10 minutes, M1=1 minutes). The total frame time should be less than 20mS, to avoid flickering. DO NOT blank, by turning all cathodes OFF. Especially, when using cathode drivers like a 74141 (or its Russian equivalent). If you attempt this with these devices, they will see over ~100V, and will conduct thru more than one cathode at a time. This will look similar to ghosting. These devices are leaky, so at least one cathode should be ON at all times. Turn-ON time decreases as supply voltage increases. Use a higher supply voltage when possible. Just because the specs say 170V, doesn’t mean you need to use 170V. This is a minimum value, to ensure striking. Remember that anode resistor. Its REQUIRED ! When a nixie turns ON, the voltage drops to its sustain level (130V to 150V). The difference (Supply – Sustain) is dropped across that anode resistor. That sets the operating current. Use a supply of at least 180V. 190V to 210V is even better, if its a multiplexed circuit. Click on drawing for better resolution. 1. All resistors 1/4W, 5% Carbon Film. R3 & R4 1/4W 1% Metal Film. 5. C1 – 220uf, 25V Low ESR. 0.3 ohms or Less. D2 and Q2, form active pull-down. This allows Q2 to discharge Q1’s gate charge much faster, than R2 (1K) can do by itself. Effectively making it look like a 10 ohm resistor. But only when swinging down. Swinging up, turning ON Q1, then Q2 is out of the picture. The beauty of active circuits. Efficiency can be as good as 80%. This circuit can deliver close to 45mA (180V out), with 12V in. Note, you can get both higher positive voltages (+360V & +540V), and negative voltages (-180V). If a voltage isn’t quite right, you can always fall back on your early electricity classes. Thévenin equivalents, can be used. Suppose you need +450V, and the anode resistor is 680K. 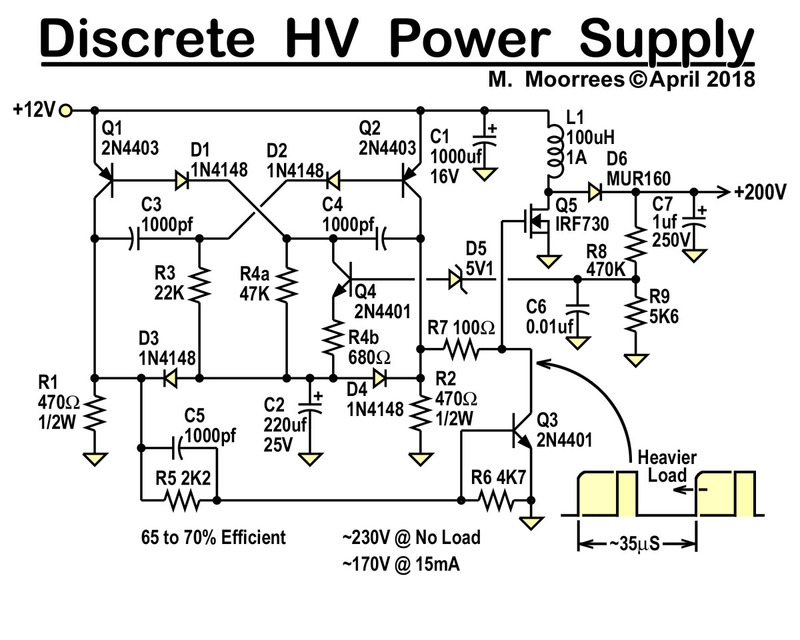 Make a divider, and hook it up to the +540V supply. The divider will output 450V (unloaded) if you pick 820K, and 3.9M. Also, they look to the anode, like a 680K resistor, since 820K in parallel with 3.9M, is 680K. Here’s a reference to Thévenin, if you need more convincing. In this circuit (MK 1) , the MC34063 can only actively pull-up (and turn ON) the FET’s gate. Turn-Off is only thru R2 (330 ohm). Turn-Off is critical, because that’s when the high voltage pulse is generated. You want that as quick, and clean, as possible. This simpler MK1 circuit can only deliver ~10mA, before the FET gets too hot. Poor efficiency (under 60%). The MK1.5 circuit can deliver close to 45mA, at an efficiency near 80%. Alternate chip to the MC34063. The UC3843 both sources and sinks the FET (Q1). No other drive components needed. On the down side, it needs at least 9V to work, and has internal shutdown circuitry, that switches it OFF, if the input voltage gets too low. Regulation is poor, relative to IC based supplies, but adequate for nixie use. It is also less efficient than most IC based power supplies, but comparable to 555 based designs. Maximum recommended output is 15mA. Its based around an astable multivibrator, using PNP transistors. Regulation is performed by varying the duty cycle, by varying the RC time of R4 & C4. Q4 acts as a current source for charging C4, and varies with the output voltage. The higher the voltage, the shorter the period that the MOSFET (Q5) is ON. Q3 is also added to speed up the discharge the MOSFET’s gate. The line frequency from your household AC power, historically, has been kept accurate, so that old motor driven clocks maintained proper time. During daylight hour, the power frequency lags, due to the heavy demand. The power company, to compensate, speeds up the generators, during the wee hours of the early morning, to catch up. They make sure that exactly 5,184,000 cycles (in 60Hz areas), or 4,320,000 (in 50Hz territory) occur in a 24 hour single day. If your nixie clock’s power comes from an AC wallcube, or other stepdown transformer, you can tap one of the AC leads going into your fullwave bridge, as shown in red (existing power supply circuit), and purple (signal conditioner). One BCD stage of the 4518, divides the 50 ro 60Hz, by either 5 or 6, to get 10Hz. Then the second stage futher divides it by 10, to get a 1Hz output. To make the first stage divide by either 5 or 6, the counter is reset to zero, when it reaches the max count. Here its done using an AND gate made simply from two diodes, and a resistor. The counter is reset, when The reset input (R) sees a logic one. This only occurs when a binary count of ‘5’ or ‘6’, occurs, depending on how the jumpers to D3, are hooked up. To QA, for div-by-5, and QB, for div-by-6. The purple section, converts the AC half wave, from one of those taps, to a clean square wave pulse. R1 is needed, as the AC comes to its zero crossing, and drops between the forward drops of it rectifiers, the impedance goes to infinity. If a resistor was not present, Q1 would turn off slowly, and output would also rise slowly. R2, R3, and C2 suppress noise spikes from creating extra, unwanted pulses. Q1 can be any small signal NPN, such as a 2N2222, 2N3904, or whatever you have in your junk box. Mostly seen on the Russian IN-18 nixie tube, when displaying the numeral “1”, there appears a small glowing blue spot of gas, just in front of the digit. Its sometimes seen in other tubes, and usually the larger ones. Back when these tubes were used in instruments, it wasn’t an issue. The display usually had a transparent red plastic filter in front of the tubes, so the blue glow, if present, was blocked by the filter. The filter would only let red light thru. 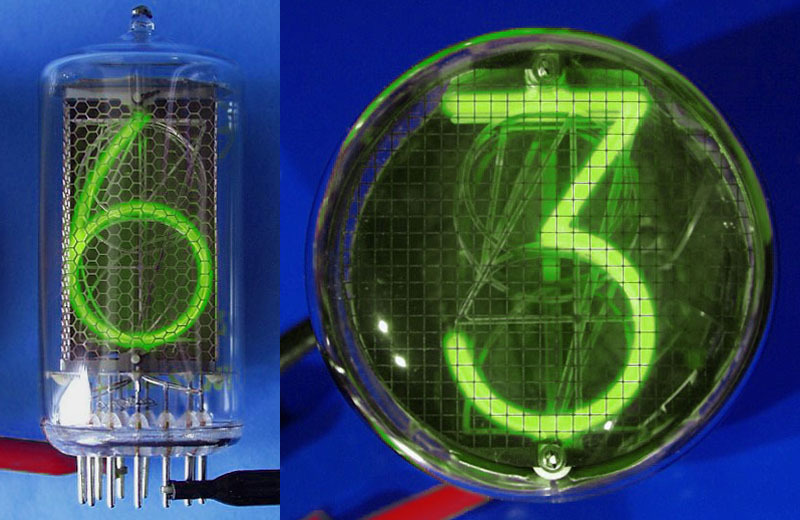 Since the decimal point makes for a very small anode, all the current that makes the digit glow must also pass thru it. This means the blue glow happens when the current density exceeds some particular threshold. Many, if not most nixie clocks use the 7441, 74141, or its Russian equivalent ICs, to drag the desired cathode to near ground potential (zero volts), to turn it ON. Simple open-collector transistor stages, which have the collectors of the 10 output NPN transistors tied to their respective nixie cathode (0-9). The emitters of all 10 transistors are tied to ground. Some simple logic turns ON only one of these transistors at a time, which allows the selected cathode current to flow to ground. The remaining 9 “off” cathodes, an connected transistors float to some random voltage. Ideally they should go up to the anodes voltage, so the voltage difference between the anode and “off” cathodes is zero. Fortunately, there needs to a significant voltage difference between the anode and cathode, for current to flow, for it to glow. Usually between 130 to 150V. That means if the supply is 170V, then cathode only needs to rise to 40V (170V – 130V), to stay “off”. Nixie driver ICs, of the day, usually had zener clamps around 65V, because high voltage transistors did not exist (or at economical) at that time. But my experiments found that even though, the “off” cathodes, stayed off, they still drew a small amount of current. 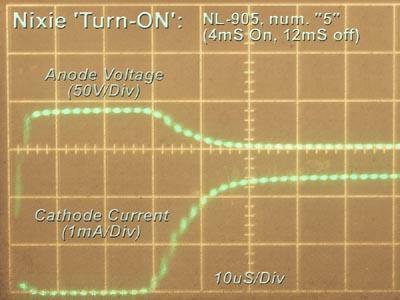 This altered the current flow pattern inside the IN-18 nixie tubes, changing the current density, in all areas of the tube. But most notably when the “1” numeral is lit. It makes a narrow current channel to the anode, and the off cathodes may be acting as beam forming plates, as in beam power tubes, like the 6L6. The blue dot could be created at will. More so, the lower the voltage is, on the off cathodes (Vk). The solution, is very simple. Use cathode driver transistors, that can rise to above 90V. Now common transistors like the MPSA42, and 2N6517, will do the job. Also make sure, your mid-pull voltage is between 90 to 110V. In real life, the difference is much greater. In the past, I’ve used drivers like the TI SN75468, which can handle upto 100V, but the test results show that an Allegro ULN2003 (50V max), can also be used. Both these chips contain 7 open collector darlington drivers. They were originally made to drive solenoid hammers, in old dot matrix printers. They are pin-to-pin compatible with each other. The only difference is that the SN75468 can tolerate a higher voltage. 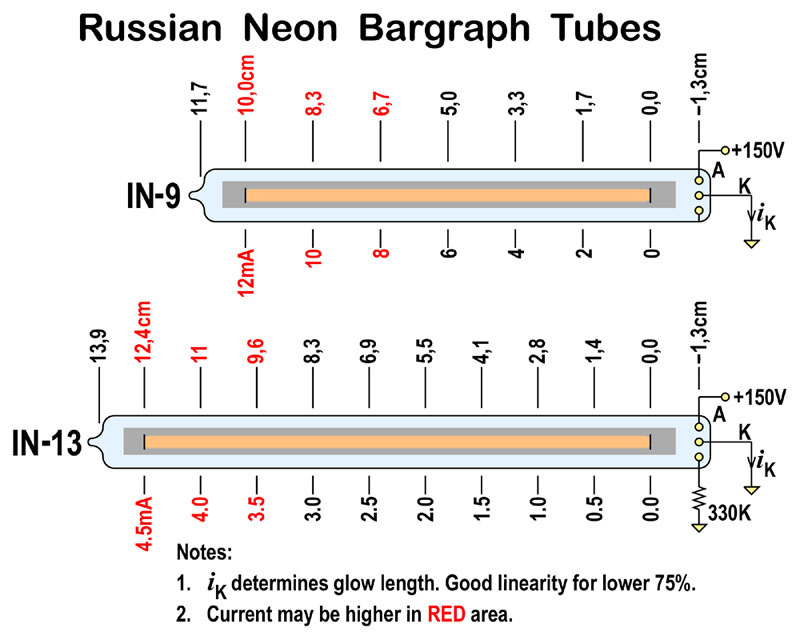 Something to do with Russian neon bargraph tubes. This circuit is for the IN-13, which uses less current than the IN-9. It has two sections. The first section uses uses a LM393 comparator chip to generate 140V. Half of the chip is a pulse generator, for pulsing the power FET (Q1), to make the HV. The other half, monitors the voltage, and inhibits pulse generation, when the desired voltage is reached. The second section is a phase shift oscillator made around Q2, a common PNP transistor. The phase shift oscillator controls the current thru the bargraph tube, thru Q3. It does this by making the voltage across R11, follow the sine wave. That means the current thru R11 is also a sinewave, which is the same as the collector current (almost the same, but close enough for government work). The collector current is the same current that flows thru the bargraph, and there you have it. Click here to see the video of the winker working. Note: Both IN-9 and IN-13 have a circular diameter of 9,5mm (~3/8″). Nixie – Article at Wikipedia. No such thing as a green nixie. This is a composite photo of two ordinary orange nixies. A little Photoshop magic of the color settings, and then you have a little April Fools joke. Radio Shack once sold nixie tubes. Only for one year though. Sold VFD displays, too. The 11-18mA operating current, for the nixie, is an oversight by Radio Shack. 11-18mA, is the peak current, if the tubes are multiplexed. 1.0 to 2.5mA is more appropriate for this nixie type, for continuous operating current, or the averaged level, if multiplexed. Nixie Clocks that I Made. Power FET Primer – Philips guide to using power MOSFETs. Take a look at p57 for something familar.